What's The Major Bebop Scale? The major bebop scale is an octatonic scale (eight notes) and it will take exactly four beats to play if the eight notes are used. It contains the same notes as the major scale (ionian mode) including a chromatic passing tone (#5) between the fifth (5) and the sixth (6). Playing the major bebop scale over major seventh chords brings tension because of the #5, this is a passing tone so you need to resolve this note in your major lines and avoid to play it over strong beats. Before learning this scale, be sure to master the Ionian mode. What is The Formula and Interval Pattern For The Major Bebop Scale? How To Apply The Major Bebop Scale? 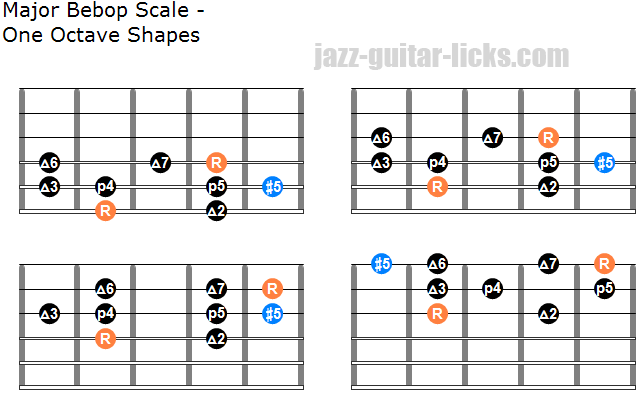 The major bebop scale can be played over any major chords (non altered). Maj, maj7, maj6, maj13, maj9, maj11, sus2 and sus4. How To Play The Major Bebop Scale On Guitar? Be sure to play these patterns in twelve keys. Playing the corresponding chord is a good way to make the link between scales and chords. For example if you play the G major bebop scale, just play a Gmaj chord (maj7, maj6). These two diagrams show how to play the major bebop scale within the space of two octaves. Here is an easy jazz lick using the bebop major scale, you can see the #5 on bar 2, specific to this scale. Notice that it starts with a diatonic enclosure. (D-B-C).